All season, Mayfield has gotten consistent and mostly clutch performances from their top two singles players, as well as the Cubs top doubles tandem. Fortunately for coach Silvana Stans, those three held their own in first round of the postseason as well. Lauren Panajotovic and Carly Hall each went 3-0 in singles. Ariana and Alexia Saigh also earned three wins by scores of 6-2, 6-0, and 6-2. Those nine wins were crucial as the rest of the Cubs lineup went a combined 2-7. La Serna’s singles players all defeated the Cubs No. 3 player, 6-0, 6-0, and 6-0. Panajotovic’s wins came by scores of 6-1, 6-0 and 6-0 and Hall earned 6-3, 6-0 and 6-1 match victories. 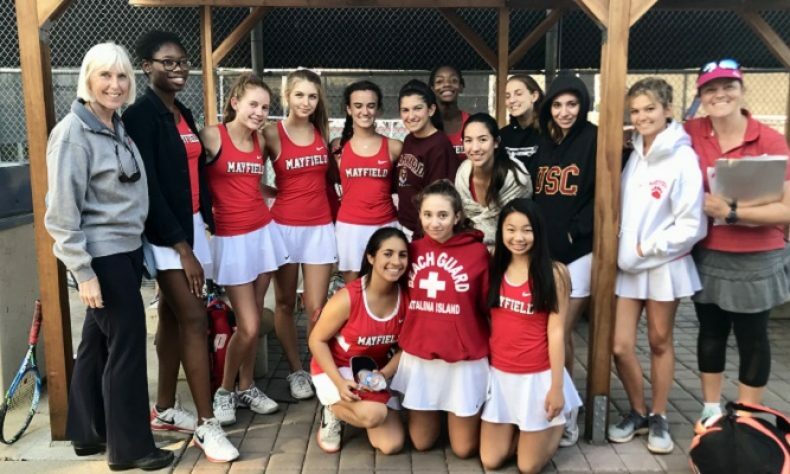 Sammi Kennedy and Sofia Mireles earned one win for Mayfield in the No. 3 doubles slot and Ashlinn and Elise Kingston also claimed a 7-5 victory over the La Serna No. 2 doubles team. The Prep League co-champs will face the Rio Mesa-Brentwood Friday at 2.